Pain in the heel is the most musculoskeletal condition podiatrists are confronted with in the nation. Plantar fasciitis causes subcalcaneal pain syndrome, which is increasing in frequency and tends to affect the largest age group of the population, those between 40 and 60 years of age. There have been many studies done on the best treatment for plantar fasciitis, and the literature is full of both comprehensive scientific reviews and anecdotal evidence for how to deal with the condition. It is generally agreed that plantar fasciitis is best treated without the use of surgery, and patients often report symptoms disappearing after a year of non-surgical treatment. There is a large difference in treating plantar fasciitis in athletes and among the general population. For a normal, mostly sedentary person, treatment includes a lot of rest and pain management, and a long recovery period. Athletes require a different and more involved treatment approach. When the plantar fascia, the band of tissue running across the bottom of the foot from heel to toe, gets overloaded, it causes subcalcaneal pain syndrome. The overload can be from micro-tears at the interface of the bone and tissue, or from tears within the tissue itself. The pain is caused by the resulting inflammation in the plantar fascia, which can also lead to degeneration of the tissue. Inflammation can also cause heel spurs, a calcium deposit that causes a bony protrusion on the heel, but these are often not the main cause of the pain. Many patients have heel spurs but none of the symptoms of subcalcaneal pain syndrome. Only about 10% of x-ray visible heel spurs involved symptoms. Some suggest that the heel pain is caused by the entrapment of the medial calcaneal nerve or the first branch of the lateral planar nerve, but the underlying cause of this entrapment is still due to overloading the tissue of the plantar fascia and other soft tissue of the foot. There is not much agreement in the medical literature about the biomechanical cause of this condition. Some suggestions include uneven leg length, pronation of the subtalar joint, limited dorsiflexion of the ankle joint, abnormally high or low arches, weak plantar flexion, and heel strike shock. For runners, a lower arch height has not been shown to correlate to plantar fasciitis. Most runners that complain about heel pain actually have medium or high arches. A study by Scherer et al suggests that supination in the longitudinal axis of the midtarsal joint is frequent in patients with heel pain. This occurs in two main instances: when there is a deformity of the forefoot valgus or when the heel turns beyond the perpendicular. Generally, an athlete’s main concern when treating heel pain is to recover quickly and return to normal training and activities to maintain their fitness and performance. This means that treatment has to be more aggressive for an athlete than for an average sedentary person. Doctors recommend that athletes continue with cardiovascular exercises while resting from activities that stress the plantar fascia and may cause further damage or prevent proper healing. For runners, dancers, or players of sports that require a lot of running or jumping, this means stopping those activities and avoiding running and jumping until symptoms improve. Instead, athletes should replace these activities with things like stationary cycling, swimming, upper body weight training, and low-resistance flat-foot stair machines that have less impact on the plantar fascia. The shoes one wears have a significant impact on patients with subcalcaneal pain. Improper footwear can cause more pain, but the right shoes can help alleviate symptoms. 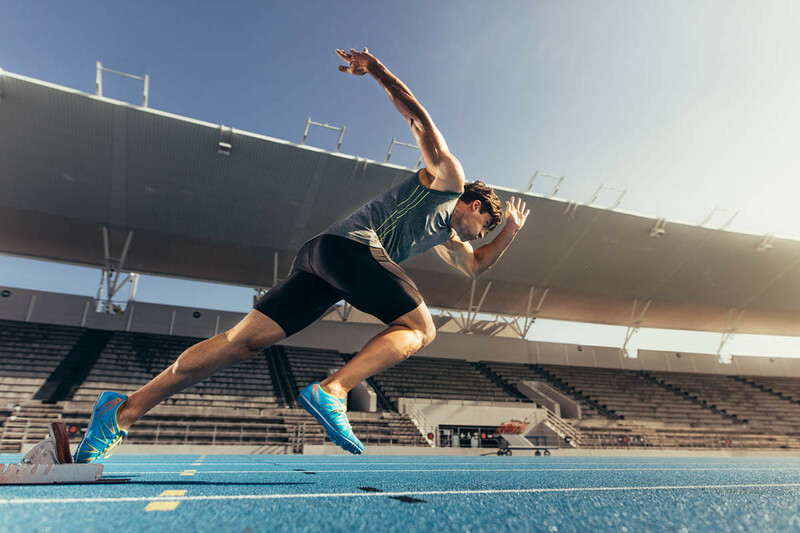 Athletes should wear shoes with a heel height of no more than one inch, and they should have a strong and stable midfoot shank with unrestricted forefoot mobility and flexibility. Athletes can find suggestions for good footwear on the website of the American Academy of Podiatric Sports Medicine, www.aapsm.org. Recently, trends in shoes for athletes have caused a large number of cases of plantar fasciitis, owing to the fact that these contemporary designs have weak midsoles compared to classic designs. It is becoming common to see shoes with two-piece outsoles and an exposed midsole, which causes extra stress on plantar fascia when running or jumping. It is advisable for athletes to avoid these shoes if they want to prevent injury. It is also important to wear shoes whenever one is standing or walking, even indoors. Walking or standing barefoot or in sandals is not recommended. There are many things athletes can do at home to help heal plantar fasciitis and subcalaneal heel pain. Stretching the tendons and muscles in the foot is an essential part of the recovery process, and this can be done at home once the correct motions are learned. Wearing a splint at nighttime can also be extremely beneficial, as it stretches the plantar fascia while you sleep and prevents it from contracting as it normally would when relaxed. Rolling or massaging the foot with a golf or tennis ball will also help by increasing blood flow and breaking down adhesions. A custom-made foot orthosis can be extremely beneficial in the process of healing plantar fasciitis. It is rare for a relatively sedentary patient to require one, but an athlete should consider this option early in the treatment process, as they will be putting greater pressure on their feet both during their recovery and upon returning to normal activity. There is also evidence that arch taping provides immediate and significant relief, and works well in conjuction with semi-rigid or rigid orthotics. Most athletes will likely already be familiar with physical therapy for the various types of injuries and stresses the body endures during sports. While physical therapy can take up a lot of time and can be painful, if an athlete is serious about getting better then they will be willing to invest the time to recover properly. It is always helpful when a sports podiatrist has a good working relationship and communication with a physical therapist, to provide the best care and ensure a speedy recovery. While corticosteroid injections speed healing and help manage pain levels, it’s not recommended to rely too heavily on these anti-inflammatory treatments as overuse can lead to a sequela of steroid use. There have been cases of spontaneous rupturing of the plantar fascia after corticosteroid injection, so this treatment should be a last resort only if the previous methods do not work. It is clear that athletes require different treatment strategies than the average population when it comes to treating plantar fasciitis. The more aggressive treatment is due to the fact that the goals of the athlete will be different, as they will want to heal as quickly as possible and return to their normal level of activity and stress on the heel so they can continue their career. However, it is important to be wary of quick fixes such as corticosteroid injections that could increase the risk of further injury. The foundation of treating plantar fasciitis is understanding the underlying pathomechanics of the condition and using biomechanical solutions to reduce the stress on the tendon. The best treatment strategy is utilizing custom designed and fitted semi-rigid or rigid foot orthoses to reduce stress and allow the foot to heal so the athlete can resume their activities.